The Yellow-footed Rock Wallaby (Petrogale Xanthopus) is one of the most beautifully coloured and patterned species in the Macropod family. It’s known for its long orange-brown tail with dark rings, white-striped face and flanks and of course vivid yellow feet! As the name suggests, rock wallabies live across rocky outcrops including escarpments, cliffs, large boulders, scree and crevices. 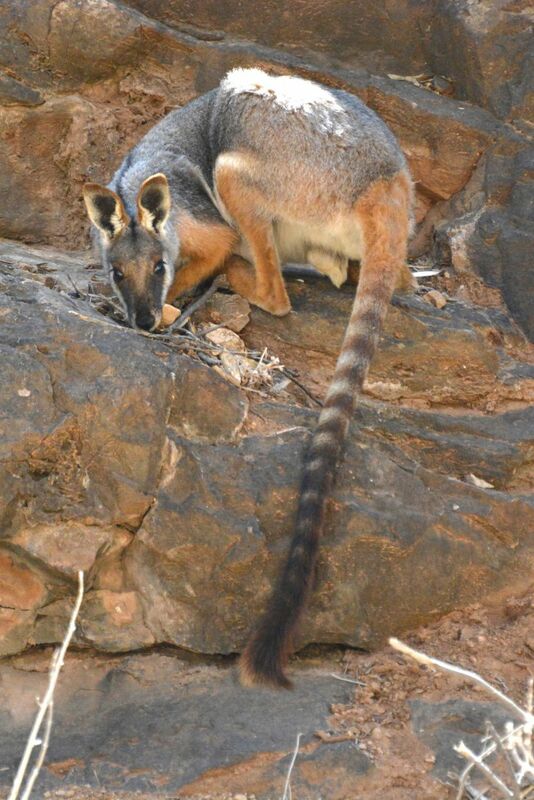 There are 16 species of rock wallaby found across Australia, with the Yellow-footed Rock Wallaby confined to semi-arid ranges across South Australia (Gawler and Flinders Ranges), New South Wales (Gap and Cotauraundee Ranges) and Southwest Queensland. This species is remarkably camouflaged against rocky habitats, especially when the landscape is basked in sunlight. On many occasions, they can only be spotted when there is a slight trace of movement, so you should keep your eyes peeled! After rain, the species will feed on grasses and revert to foliage on bushes and trees during dry periods. Yellow-footed Rock Wallabies can traverse across rocky environments with relative ease, due to their broad, short feet with granular pads on their soles, powerful hind legs (with long central claws) and arched tail for balance. Yellow-footed Rock Wallabies stand approximately 60cm tall and weigh up to 12 kilograms, with males slightly larger than females. They have a verticle jump of approximately two metres! Unfortunately, the population of Yellow-footed Rock Wallabies has plummeted since European settlement, with the species hunted until the 1920s for sport and their skins. Predation by feral animals such as red foxes and feral cats as well as competition for food from goats, rabbits and sheep have severely impacted their numbers. The species is currently listed as Near Threatened in the Flinders Ranges region. They have definitive territories in remote parts of the Elder Range and edge of Wilpena Pound. Colonies generally consist of a number of breeding females with their offspring and a dominant male. Due to conservation efforts, Yellow-footed Rock Wallaby are commonly sighted in pockets of the Flinders Ranges National Park, as they come down off the scree slopes in search of water. Arkaba Conservancy is playing a key role in re-establishing this species to the area. A 2012 survey of the Elder Range on Arkaba identified two colonies, that with continued feral animal control should spread and re-populate successfully. Where can I see this species with an expert guide? What tour should I book to help support conserve this species?